Last week, I introduced a brand new series up every Friday: Operation Organise. For those of you who don’t know me, I am obsessed with being organised. I plan my days, I write daily to-do lists, I like to maximise my time. In order to do that, it is really important to get your home in order. Recently, after becoming obsessed with Marie Kondo, it inspired me to create a series to help my fellow bloggers. Many of Marie’s tactics are a bit out-there to me so I’ve come up with my own tips and tricks to help you out. In this edition, we’ll look at your wardrobe. Marie suggests you start with clothing as it is the household item with the least emotional attachment. For me, I believe that’s false. I can always remember what I wore to a certain event. However, your wardrobes take a lot of room up and tend to be the first place that gets cluttered. Take everything out. It’s sometimes scary to see how much you actually own when you see it in piles on your bed! Try each item on. You can only tell so much about an item by looking at it. If it’s an item you wear frequently and know fits well, you can have a free pass and put it straight back in the wardrobe but this should be done for as few items as possible. pass down to your little sister, maybes. Be ruthless. If you don’t wear it, give it someone who will or donate it! Once everything is in your wardrobe, sort them out as you want. 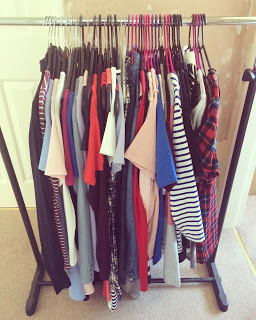 I sort items by category (vests, t-shirts, blouses, jumpers etc.) and then usually by colour within that. Throw away pile: the only items in this pile should be anything dis-coloured or completely worn out. Donate/sell/pass down: make sure everything is in good condition and get rid of these as soon as humanely possible. The longer they are lying around the house, the more likely you are to take something off the pile and keep it! Maybes: Try these items on again. If you keep them, place them in your wardrobe and if you don’t wear them within six months, get rid of them. If you don’t like them, get rid of them either by donating, selling or giving to someone who would want them. Out of the ones you’re keeping, make sure they are clean, fit well and don’t require any maintenance on them. If they need any work doing on them, do it now. The main tip is to be as ruthless as possible. If you don’t wear an item and haven’t in a while, just get rid of it. Someone else somewhere will want it! I like to sell my good stuff on eBay because I need as much money as I can get right now; then I donate the items that I don’t think would sell to charity. If you have a little sister/cousin.friend of the family, give a bag of clothes to them instead.